BTS are only getting bigger and better every time their name hits headlines! Only this time, they make history once again by being the first ever Korean K-pop Idol group to present an award at the Grammys! And how we are all so proud of them, from being this seven member boy group debuting with big dreams in 2013 to walking into the Grammys 2019 with style wearing Jay Baek Couture & Kim Seoryong making history. The worldwide boy group BTS has kept making moves non stop. They were seated alongside celebrities like Anna Kendrick, Dolly Parton and Miley Cyrus. BTS presented the award for “Best R&B Album” to the R&B artist H.E.R who showed respect back to the group by bowing as V gave her the award. BTS had quite an intro as they were introduced to present after the ‘Motown Tribute’. Their 2018 hit song ‘Fake Love’ started playing as they walked onto the stage and a microphone came out from the ground. BTS’ leader RM went on to begin their speech saying “Growing up in South Korea we always dreamed about standing at the Grammys stage. Thank you to all our fans for making this dream come true, and we will be back“. This definitely got us all off our chairs. They continued onto announcing the award. Throughout the show – and even before – BTS was showing nothing but smiles and pure happiness. During interviews, they spoke about how nervous but also excited and blessed they were to be here all thanks to Armys. During one interview with Entertainment Times, they were asked what they will do after the Grammys. Member Suga mentioned sleeping but Jin was quick to correct him and said “No, no, no we want to meet our fans Armys on the Vlive app” which they went on to as soon as they got back. They have now gone live twice and you can watch the first one here and the second one here! Besides being worldwide idols, celebrities, leaders and role models they have never changed their characters or personalities and continued to stay true true to themselves. They added colour to the red carpet and award show audience – and not only by their hair colours. They were continuously showed throughout the show for their bright smiles and priceless reactions to performances and presenters. 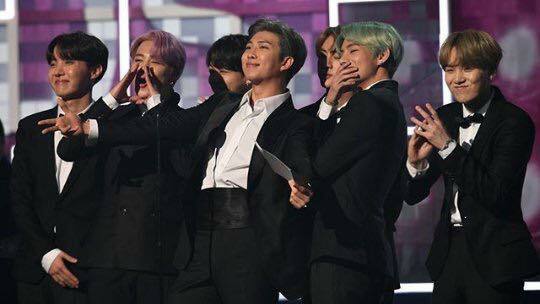 Even RM didn’t hold back his loud “YAY‘ multiple times as he announced the winner and waited for H.E.R to approach the stage. 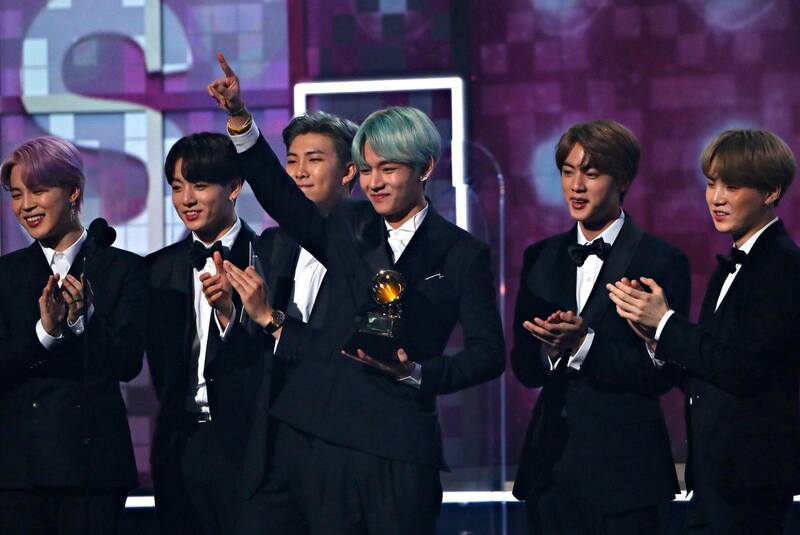 Armys also did their part online on Twitter by getting hashtags trending worldwide for BTS saying #TearItUpBTS. Even people who don’t know BTS were retweeting tweets about them. They recognised them by their hair colours, asking who they are and letting everyone know how good looking they are. Fans continued to sharing posts about them all over social media platforms about how proud they are of them and how far they’ve come. Pdogg, Slow Rabbit and even the Staples Center shared on their personal Instagram supporting BTS and showing love. There is no doubt BTS will continue to make history in the future and even near future. They have already hinted during interviews today about their next album already in the making. The group told fans to look forward to what they have in store for us, and even some possible collaborations. And after today knowing how happy they are and who they have met and what they have accomplished today, we all cannot wait to see what BTS has next for us. 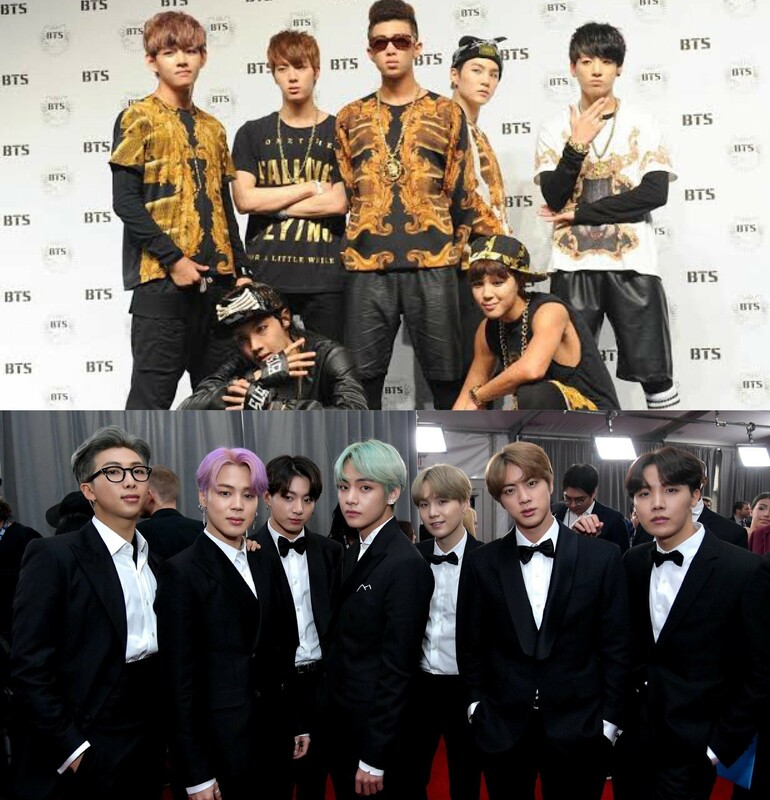 What are your thoughts on BTS today at the Grammys? What would you like to see next for them? Who would you like to see them meet or collaborate with? Let us know in the comments below! Keep following Offically Kmusic for more updates. Halsey and BTS’ RM show off their special handshake in new Twitter post!